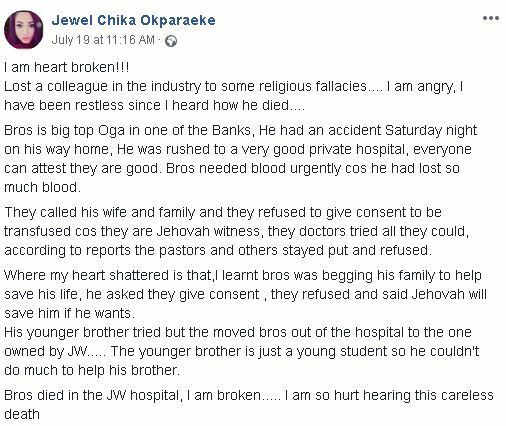 A Lady on Facebook has shared the sad story of 'Jehovah Witness Devotee' who was involved in an accident and could have been saved but for his refusal to undergo blood transfusion, ended up losing his life. Bros is big top Oga in one of the Banks, He had an accident Saturday night on his way home, He was rushed to a very good private hospital, everyone can attest they are good. Bros needed blood urgently cos he had lost so much blood. They called his wife and family and they refused to give consent to be transfused cos they are Jehovah witness, they doctors tried all they could, according to reports the pastors and others stayed put and refused. Where my heart shattered is that,I learnt bros was begging his family to help save his life, he asked they give consent , they refused and said Jehovah will save him if he wants. His younger brother tried but the moved bros out of the hospital to the one owned by JW..... The younger brother is just a young student so he couldn't do much to help his brother.